Air combat manoeuvring (also known as ACM or dogfighting) is the tactical art of moving, turning and/or situating one's fighter aircraft in order to attain a position from which an attack can be made on another aircraft. Air combat manoeuvres rely on offensive and defensive basic fighter manoeuvring (BFM) to gain an advantage over an aerial opponent. Military aviation appeared in World War I when aircraft were initially used to spot enemy troop concentrations, field gun positions and movements. Early aerial combat consisted of aviators shooting at one another with hand held weapons. The first recorded aircraft to be shot down by another aircraft, which occurred on October 5, 1914, was a German Aviatik. The pilot, Feldwebel Wilhelm Schlichting, was shot with a carbine wielded by observer Louis Quenault, who was riding in a Voisin Type 3 piloted by French Sergeant Joseph Frantz. The need to stop reconnaissance that was being conducted by enemy aircraft rapidly led to the development of fighter planes, a class of aircraft designed specifically to destroy other aircraft. Fixed, forward-firing guns were found to be the most effective armament a majority of World War I era fighter planes, but it was nearly impossible to fire them through the spinning propeller of one's own aircraft without destroying one's own plane. Roland Garros, working with Morane Saulnier Aéroplanes, was the first to solve this problem by attaching steel deflector wedges to the propeller. He achieved three kills but was shot down by ground fire and landed behind German lines. Anthony Fokker inspected the plane's wreckage and learned to improved the design by connecting the firing mechanism of the gun to the timing of the engine, thus allowing the gun to fire through the propeller without making contact with the propeller. As technology rapidly advanced, new and young aviators began defining the realm of air-to-air combat, such as Max Immelmann, Oswald Boelcke, and Lanoe Hawker. One of the greatest of these "ace pilots" of World War I, Manfred von Richthofen (the Red Baron), wrote in his book The Red Fighter Pilot, "The great thing in air fighting is that the decisive factor does not lie in trick flying but solely in the personal ability and energy of the aviator. A flying man may be able to loop and do all the stunts imaginable and yet he may not succeed in shooting down a single enemy." Pilots soon learned to achieve a firing position (while avoiding the threat of enemy guns) by manoeuvring themselves behind an enemy aircraft; this is known as getting onto an aircraft's "six o'clock" or onto their "tail", plus a wide variety of other terms, usually coined by air crew. This type of combat became known as dogfighting. Oswald Boelcke, a German fighter ace during World War I, was the first to publish the basic rules for aerial combat manoeuvring in 1916, known as the Dicta Boelcke. He advised pilots to attack from the direction of the sun (toward which the defending pilot could not see), or to fly at a higher altitude than the opponent. Most of these rules are still as valuable today as they were a century ago. Today's air combat is much more complicated than that of older times, as air-to-air missiles, radar, and automatic cannons capable of high rates of fire are used on virtually all modern fighter aircraft. New, and additional types of manoeuvres have emerged, intending to break radar lock by minimizing the Doppler signature of one's own aircraft ("keeping the enemy at 3 or 9 o'clock"), or to exhaust the kinetic energy of an incoming missile (by changing the aircraft's course from side to side, the missile, not flying directly at target but trying to forestall it, will make sharper turns and will eventually have to fly a longer path). However, close range fighting with infrared guided missiles and aircraft cannons still obeys the same general rules laid down in the skies over Europe in the early 20th century. The master rule is still the same: do not let your opponent get onto your six, while attempting to get on his. There are five things a pilot must remain aware of when contemplating aerial engagement; of these, seeing and keeping sight of one's opponent are the most important. In Southeast Asia, over 85 percent of all kills are attributed to the attacker spotting and shooting the defender without ever being seen. 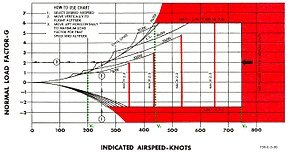 Structural limitations of the attacking and defending fighters must be taken into account, such as thrust-to-weight ratio, wing loading, and the "corner speed" (the maximum or minimum speed at which the aircraft can attain the best turning performance). Variable limitations must also be considered, such as turn radius, turn rate and the specific energy of the aircraft. Position of aircraft must quickly be assessed, including direction, angle off tail (the angle between flight paths), and closing speed. Also, the pilot must be aware of his wingman’s position and maintain good communication. A pilot in combat attempts to conserve his aircraft’s energy through carefully timed and executed manoeuvres. By using such manoeuvres, a pilot will often make trade offs between the fighter’s potential energy (altitude) and kinetic energy (airspeed), to maintain the energy-to-weight ratio of the aircraft, or the "specific energy". A manoeuvre such as the "low yo-yo" trades altitude for airspeed to close on an enemy and to decrease turn radius. The opposite manoeuvre, a "high yo-yo", trades speed for height, literally storing energy in "the altitude bank", which allows a fast moving attacker to slow his closing speed. An attacker is confronted with three possible ways to pursue an enemy, all of which are vital during chase. "Lag pursuit" happens in a turn when the nose of the attacker’s aircraft points behind an enemy’s tail. Lag pursuit allows an attacker to increase or maintain range without overshooting. "Lead pursuit" in a turn occurs when the nose of the attacking aircraft points ahead of the enemy. Lead pursuit is used to decrease the distance between aircraft, and during gun attacks when the cannons must be aimed, not at where the defender is, but where he will be when the bullets get there. "Pure pursuit" happens when the nose of the attacker points directly at the defender. Pure pursuit is when most missiles will be fired, and is the hardest position to maintain. These are known as pursuit curves. Robert Stengel: Flight Dynamics. Princeton University Press, 2004, ISBN 0-691-11407-2. ^ a b c Who Killed the Red Baron? October 7, 2003. PBS. ^ a b "Early Air-to-Air Combat". BBC. ^ The Red Fighter Pilot. Richthofen.com. Retrieved on 2010-11-16. ^ "Dicta Boelcke - Organization of Jagdstaffeln and the demise of Boelcke". Archived from the original on 2009-10-25. ^ a b c d e f g h i j "Basic Principles of BFM Archived 2011-08-05 at the Wayback Machine". ^ Air Force Glossary. Gruntsmilitary.com. Retrieved on 2010-11-16. ^ Sick's ACM School: Maneuvers Explained Archived 2009-08-31 at the Wayback Machine. 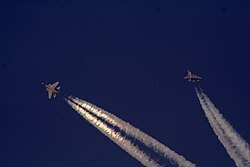 352ndfightergroup.com. Retrieved on 2010-11-16. ^ Advanced Combat Manoeuvres - Battleground Europe Wiki. Wiki.battlegroundeurope.com (2008-08-15). Retrieved on 2010-11-16.